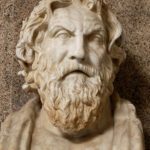 Antisthenes was a Greek philosopher and a pupil of Socrates. Antisthenes first learned rhetoric under Gorgias before becoming an ardent disciple of Socrates. He adopted and developed the ethical side of Socrates’ teachings, advocating an ascetic life lived in accordance with virtue. Later writers regarded him as the founder of Cynic philosophy. "Quarrels often arise in marriages when the bridal gifts are excessive." "As iron is eaten away by rust, so the envious are consumed by their own passion."